I am a long time user of Quizlet. I adore it for independent practice, and while I have sometimes tried to play their games in class (using a white board and volunteer), it hasn't been the easiest. Just this week I got the e-mail about Quizlet live and I was PSYCHED. So, with very little prep and almost no time reviewing the vocabulary words. I jumped onto Quizlet! Within minutes my students were ready to play (either on laptops or cell phones), and by the end of class (seven minutes later), they were all up and out of their desks near their team actively cheering each other on and mastering vocabulary together. SUCH A GREAT moment. If you're a video person, here's a video of how it works. A game students can play in teams that helps them review vocabulary together. Each student needs internet connection and their own device. Cell phones, tablets, etc all worked fine when we tried. Is is like Kahoot? Do they need to see my board/screen? No! Unlike Kahoot, students will be looking at their screen and their screen only, so there's no need for a projector. How do they win?For every answer they get right they get a point. If they get an answer wrong they lose all their points and start again. The first team to answer every word correctly WINS! The risk of getting zeroed out keeps them from randomly guessing, and keeps the students who are slower still in the game until the very end. How is this different than other online games we already play? This is similar to many teacher games in that the students do NOT need a login (wohoo!). This game requires more teamwork than other games. I have used Kahoot and Socrative for group work before, but Quizlet Live students CANNOT play without a group. Granted, they don't need to collaborate with their group. When my students started and the game said to move and sit with their groups they declined... that seemed like a lot of work. However, minutes of the game starting, they were walking around trying to fin their group to help one another.I was (pleasantly) shocked. Can I use it as a test?I wouldn't. However, at the end it does tell you what words students are confusing and what words students understand. So, it can be used a way for you to evaluate how your class is doing. The video will walk you through it. I threw my students in the deep end and they managed to swim, but to make things run a bit smoother I probably would have done the Quizlet demo with them the first time. There you go! A student tested and teacher approved game that can require very little prep (similar to Kahoot you can use public Quizlets that others have created). 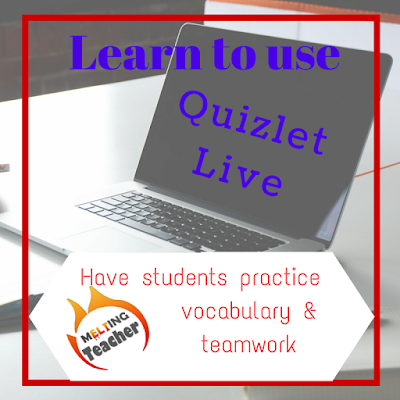 To be the best part is that students can continue using Quizlet individually to review if they realized in class they need more practice.